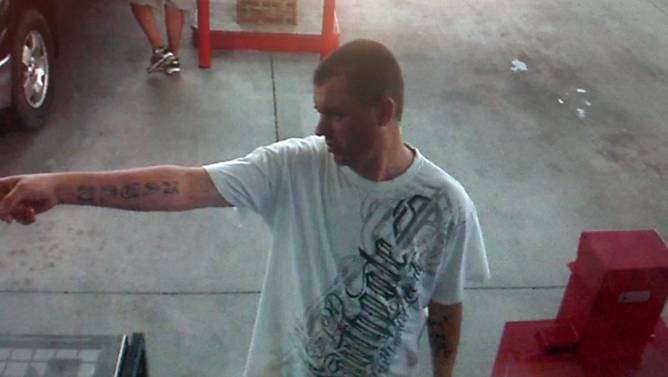 On August 18, 2014 at approximately 4:00 PM, a white male suspect arrived at the Food City Gas Station, located at 300 Clinchfield Street in Kingsport, complaining that his vehicle had run out of gas nearby. An employee of the gas station generously allowed him to borrow a gas can to refuel his vehicle. When the suspect returned the gas can, he stole a Troy-Bilt pressure washer valued at over $300. A photo of the suspect captured on surveillance video is included in this release. Particular attention should be given to distinctive tattoos visible on both of his forearms. Anyone who recognizes this individual is asked to contact the K.P.D. Criminal Investigations Division at 423-229-9429 or Kingsport Central Dispatch at 423-246-9111.